Who was your driver of the race? I think Wurz because I wasn't expecting to see him in the points and he outshone Nico Rosberg. Last edited by donald29 on 27 May 2007, 16:41, edited 1 time in total. Yeah it was one hell of a drive! He was second choice, Speed did a good job. yep, i voted other because my choice is Scott Speed! Speed did just wonderfull! But my vote goes for Alonso. Supreme driving! How many talks and gosspis were about him and Lewis.. How much pressure was on him today, and he's shown right the way it's ment to be! No chances were there for Lewis. 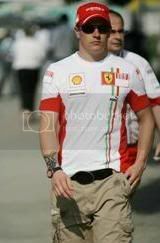 Don't get me wrong, I do like Lewis very much, even more than Fernando. Lewis proved that he can be as fast (and, sometimes, even faster) as Alonso, but Fernando has at least one HUGE advantage.. He IS 2-times world champion, and thats kind of unique expirience, that Lewis is only going to gain. Speed added to the poll. In my opinion it was Alonso, who led from start to finish, without any mistakes at all, doing the fastest lap in the process. Close 2nd come Speed & Wurz imo. [align=center]Wurz looks like an oompahloompah in this picture... look at how short his legs are!! It's surprising to see how many people chose Alonso. Winning the race does not mean being the best driver... if a driver has an easy race and finishes on top, was he better than the one who drove his nuts off for 9th?